Teapot was authorized by President Eisenhower on 30 August 1954. This series of fourteen shots proof tested a broad variety of fission devices with low to moderate yields. As a group these devices combined several innovations - some previously tested, some introduced during this test series - to create a new pattern of fission device that would dominate the design of all later weapons. These devices used new compact, efficient, light weight spherical implosion systems; beryllium tampers; hollow cores; deuterium-tritium boosting; and the use of neutron pulse tubes as initiators to create light, compact, efficient, and reliable fission explosive systems. These devices were tested for a broad variety of tactical weapon applications, including air defense (AD) and anti-submarine warfare (ASW). 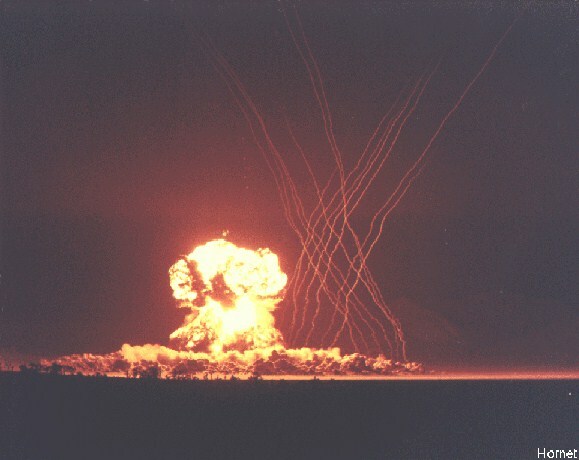 Several new primaries were tested for a new generation of lighter and more compact (Class "D") thermonuclear weapons to be fired in 1956 during Operation Redwing. 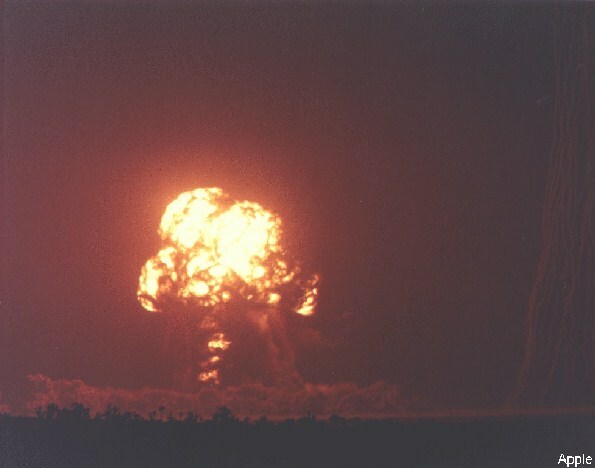 Weapons effects tests were scheduled to develop information on the use of nuclear explosives against aircraft, and to gain more information about cratering. UCRL (University of California Radiation Laboratory, now the Lawrence Livermore National Laboratory - LLNL) had its first successful test shots after two and a half years of trying. UCRL demonstrated linear implosion - a non-lensed implosion approach used in artillery shells and other applications where very small diameter systems are required. Approximately 8000 DOD personnel participated in the Desert Rock VI exercise which was intended to familiarize troops with the capabilities of nuclear weapons, and the conditions of atomic combat. LANL test shots were named after flying insects, fruits, and vegetables. UCRL test shots were named after inventors and San Francisco streets. DOD shot names were abbreviations or abbreviation mnemonics. Teapot released some 24,500 kilocuries of radioiodine (I-131) into the atmosphere (for comparison, Trinity released about 3200 kilocuries of radioiodine). This produced total civilian radiation exposures amounting to 41 million person-rads of thyroid tissue exposure (about 11% of all exposure due to continental nuclear tests). This can be expected to eventually cause about 13,000 cases of thyroid cancer, leading to some 650 deaths. Chart of fallout exposures from Teapot. From National Cancer Institute Study Estimating Thyroid Doses of I-131 Received by Americans From Nevada Atmospheric Nuclear Bomb Test, 1997. Go to the National Cancer Institute and get the full report. This B-36 airdrop was a LASL air defense oriented weapons effects test, using the venerable Ranger Able uranium core in a new compact, light weight implosion system. The implosion system was a sphere 22 inches in diameter but only weighed 120 lb (!). It was dropped in a Mk-12 bomb case. This was the fifth time the Ranger Able core design had been used in a test. 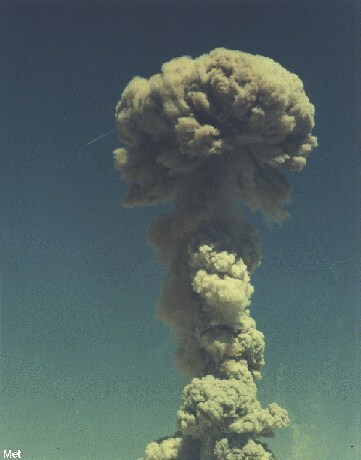 This test evaluated the effects of low altitude detonations. The total device weight was 1500 lb. 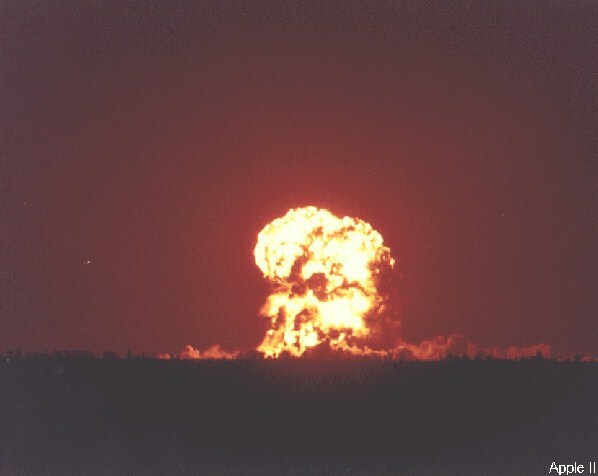 Although the bomb was much heavier, the implosion system was the lightest nuclear explosive system fired up until this time (broken the following year during Operation Redwing). This was a LASL proof test of the unboosted XW-30 fission air defense warhead. The total device weight was 445 lb (the lightest complete fission device yet fired), the actual nuclear system was 23 inches in diameter and weighed 375 lb. This was the first test to use an ENS (external neutron source) initiator - a compact pulse neutron tube. Predicted yield was 4 kt. This was a UCRL linear implosion device named Cleo I. This was also the first successful UCRL test. It used a ZIPPER external neutron initiator. Predicted yield was 3.5-7 kt. The explosive used was Cyclotol 75/25. 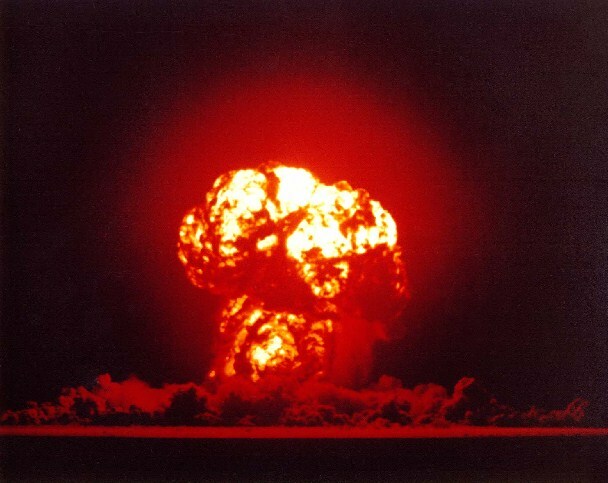 The nuclear system was a small diameter system only 10 inches wide and 39.5 inches long and weighed 785 lb. 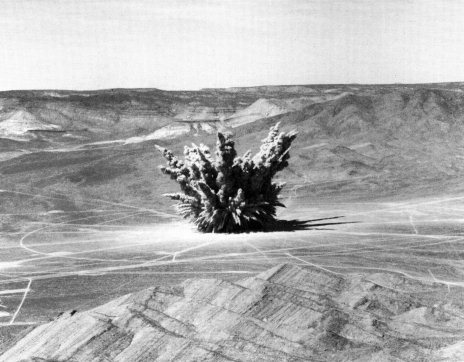 This was a UCRL test of a primary for the XW-27 Class "D" (light weight) thermonuclear weapon. The device, named LINDA, was a mockup of the XW-27 radiation case and was 30.5 inches by 61.3 inches and weighed 2325 lb. Expected yield was 45 kt. This was a LASL test of the boosted version of the XW-30 air defense warhead. It was a sealed-pit D-T gas boosted design. The maximum expected yield was 10 kt. It used a ZIPPER external initiator. Total device weight was 500 lb, the nuclear system weighed 460 lb. This was a LASL test of a sealed-pit D-T gas boosted XW-25 air defense warhead. The maximum expected yield was 20 kt. It used a ZIPPER external initiator. The nuclear system weighed 130 lb and was a sphere 17 inches in diameter, the smallest and lightest device yet fired. 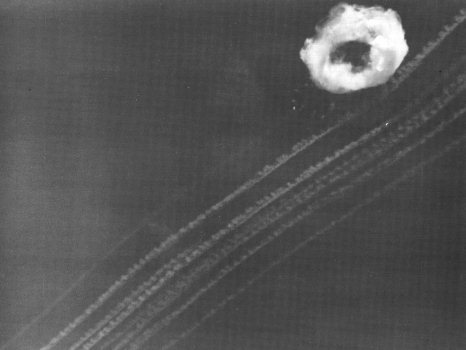 This LASL test was the sixth to use the Ranger Able U-235 core, this time in a Mk-6 HE assembly. 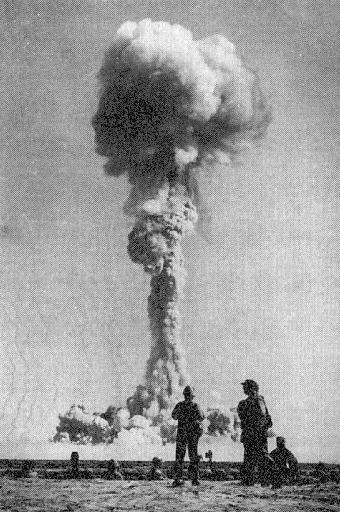 Ess ("Effects Sub-Surface") was a test of atomic demolition munition (ADM) cratering. The 8000 lb bomb was placed in a shaft lined with corrugated steel,10 feet wide and 70 feet deep (so that the bomb center was at -67 feet), which was back-filled with sandbags and dirt prior to firing. The crater was 300 feet wide and 128 feet deep. LASL test of a Class "D" (light weight) thermonuclear weapon primary and radiation implosion system, using small quantities of fusion fuel. The primary failed, yielding much less than the predicted 40 kt. No reaction was detected in the secondary stage. The nuclear system was 29.5 inches wide and 74.6 inches long and weighed 2300 lb. This was a repeat LASL test of the Wasp design, using a higher yield core for weapons development purposes, but otherwise identical. B-36 airdrop. The yield was about the same as predicted. 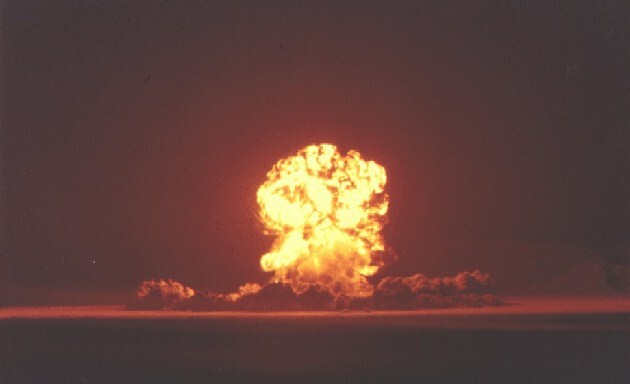 As a minor footnote - this shot was fired 5 hours and 5 minutes after Apple-1, the first time in U.S. history that two nuclear explosions were set off in one day. This B-36H airdrop was a LASL high-altitude (= HA) test of an air-to-air missile warhead. Similar to the Wasp Prime device (17 inch spherical system weighing 125 lb) in a 1085 lb Mk-5 ballistic case. Due to the extreme high altitude of this test (for an air dropped device) it was parachute retarded to permit the release aircraft to escape to a safe distance, the only parachute weapon drop ever conducted at the NTS. 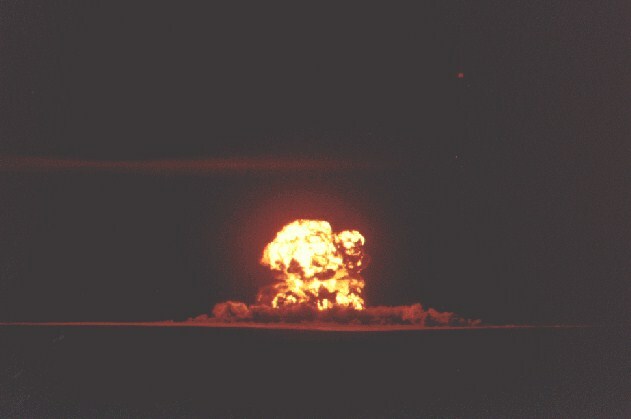 This was a test of Cleo II, the second UCRL linear implosion device. 34.2 inches long, weight 322 lb. Used Cyclotol 75/25 HE. ENS initiated. MET stands either for "Military Effects Test" or "Military Effects Tower" (according to Frank Shelton). This was a LASL test of a composite U-233/plutonium bomb core (the first test by the U.S. to use U-233) in a Mk 7 HE assembly. The 30 inch diameter spherical implosion system weighed 800 lb. 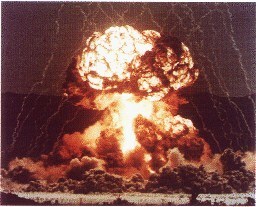 The primary purpose was to evaluate the destructive effects of nuclear explosions for military purposes. 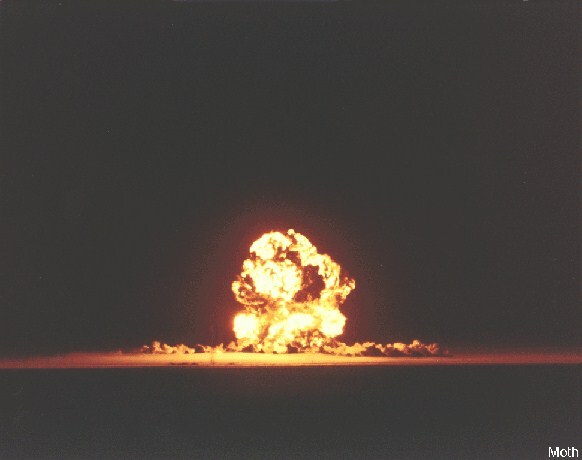 For this reason, the DOD specified that a device must be used that had a yield calibrated to within +/- 10%, and the Buster Easy device design was selected (this test gave 31 kt and used a plutonium/U-235 core). LASL weapon designers however decided to conduct a weapon design experiment with this shot, and unbeknownst to the test effect personnel substituted the untried U-233 core. The predicted yield was 33 kt. The actual 22 kt was 33% below this, seriously compromising the data collected. This was a repeat of the LASL Apple-1 shot that had an inadequate yield. This shot used a modified device (presumably with more fissile material). Predicted yield was again 40 kt. Although this device still had a yield below predictions, it was twice the Apple-1 shot and apparently was adequate. This device was another LASL test of a Class "D" thermonuclear bomb primary/secondary system. This was a light case design, presumably using an aluminum case lined with a x-ray opaque high atomic number material (like lead or uranium). The device was 40 inches in diameter, 80.5 inches long, and weighed 2925 lb. Predicted yield was 40 kt.